President Yoweri Kaguta Museveni of Uganda has commissioned the 66km Fort Portal-Kamwenge road. 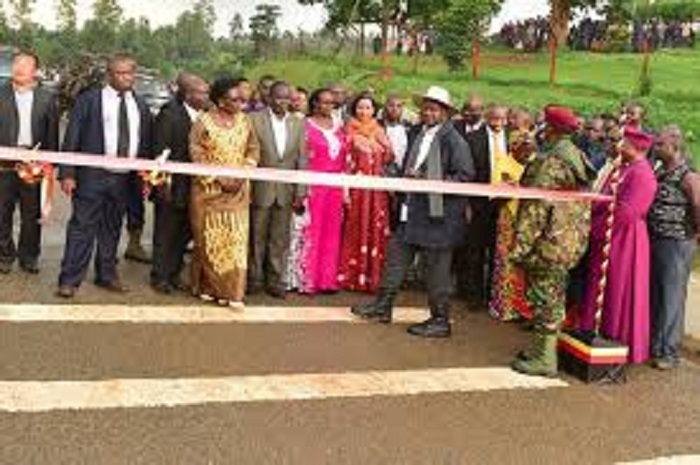 The class two tarmac road runs from Kamwenge District to Fort Portal town in Kabarole District. The Chinese Railway Seventh Group built the road at a cost of US$ 33.3mn. World Bank funded the project which began in August 2013. The commissioning comes after completion 18 months ago. The hand over of the project to the government did not take place until its recent commissioning. Nonetheless, President Museveni addressed the people from the two districts at Buhinga Stadium in the western town of Fort Portal. He thanked the World Bank for providing the initial funding for the road. The President also applauded the government’s position to prioritize roads around the country. Moreover, people along the road are urged to maximize the benefits that come out of such infrastructure. The Fort Portal-Kamwenge section is part of the Nyakahita-Ibanda-Kamwenge road. Besides, the government expects to improve connectivity/accessibility of rural economic and social centres in the region. It will serve places of high tourism attraction like Kibale National Park, improve access to an area of high agriculture and livestock potential, facilitate mining activities and facilitate the development of the hydropower plant at River Mpanga. The road also connects western Uganda to the northern corridor as well as the Democratic Republic of Congo via the Fort Portal-Bundibugyo-Lamia road. The Minister of Works and Transport Monica Azuba Ntege, urges the people along the route to put maximum economic use to the upgraded road so as to fight poverty and improve the quality of their living standards. Even after the World Bank pulled out of the project after a man from Kamwenge defiled a girl, the government contributed the remaining amount to complete the project.